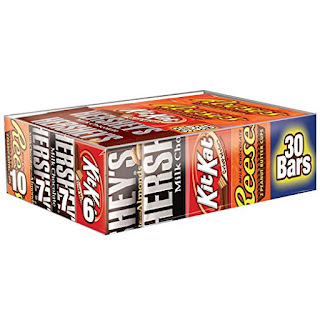 Hurry over and get this Hershey Chocolate Candy Bar Variety Pack, HERSHEY'S Milk Chocolate, REESE'S Peanut Butter Cups, and KIT KAT Bars, 30 Count Box on sale for $13.98! That's just $0.46 per bar. -This assortment includes the following candies: 6 KIT KAT Wafer Bars, 10 REESE'S Peanut Butter Cups, 7 HERSHEY'S Milk Chocolate Bars, and 7 HERSHEY'S Milk Chocolate with Almond Bars. -This product ships as one 30-count box.